The Government claims that more women than men will be impacted by Labor’s policy to stop most refunds of franking credits. Pointing to previously unreleased data from the ATO, the Government says that more women than men receive refunds of franking credits across all age brackets. “Labor’s retiree tax will hurt more Australian women than men, with women representing well over half of all Australians who rely on franking credit refunds for income,” said a joint statement by Treasurer Josh Frydenberg and Minister for Jobs, Industrial Relations & Women Kelly O’Dwyer. These figures exclude recipients of the Age Pension and similar allowances, as reported on their individual tax returns. Labor’s ‘Pensioner Guarantee’ maintains refundable franking credits for Age Pensioners and some SMSFs. 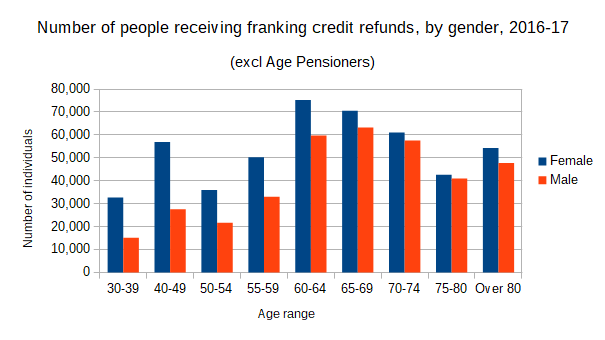 The figures released by the Government don’t detail the amount of franking credit refunds by gender or age bracket – only the number of individuals receiving refunds of franking credits. “This new data exposes an appalling gender inequity behind Labor’s retiree tax,” said Treasurer Frydenberg. “While our Government has been working hard to close the gender pay gap to a record low, Labor has been planning to wind the clock back with its retiree tax attack on women,” he said. Last year the Government rejected a number of recommendations of the Parliamentary inquiry into the economic security of women in retirement. “In the past year, we have seen the gender pay gap fall to a record low and women’s employment reach a record high, with more women in full-time work than ever before,” she said. The Government refers to Labor’s policy as a ‘retiree tax’ or a ‘retirement tax’. Though Labor’s policy does not only apply to retirees, and Age Pensioners are largely exempted. Speaking about the released statistics, Minister O’Dywer said that it is women of ages 40 to 49 – below retirement age – who are impacted most disproportionately. The ATO figures have more than twice as many women in this age bracket receiving franking credits compared to men. “In each and every Australian state the majority of individuals impacted by this policy have a taxable income of less than $18,200,” said a statement by Minister O’Dwyer. The Coalition prefers to use taxable income when compiling statistics on Labor’s policy, rather than other measures of income. Taxable income doesn’t include tax-free superannuation pensions, and is calculated after the effect of negative gearing. Franking credits are offset against tax payable, with any remaining being refundable. “Bill Shorten has to answer why he thinks it’s fair to deny these people their refunds, but is comfortable with those on higher incomes getting the full value of their franking credits,” said Minister O’Dwyer. 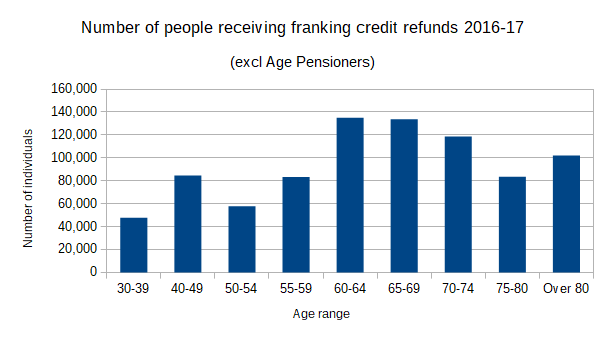 The data also shows that the age bracket with the most people receiving refunds of franking credits is ages 60-64. Most superannuation pensions are not taxed after age 60. Labor Senator Kristina Keneally accused the Government of “manipulating statistics”, saying that the reason more women receive refunds of franking credits is that high-wealth couples put passive income in the name of the lower-income partner. First, let’s remember that cash payment for excess #FrankingCredits are a tax loophole that only 4% of the population can use. The rest of us pay for it. The reason more women get cash payments for #FrankingCredits than men is because high-wealth households put passive income in the hands of the lower-marginal tax-rate person. On average, this is a woman. In short, the wealthy use #FrankingCredits as a tax loophole. On a household level – the data is clear. Cash payments for #FrankingCredits overwhelmingly benefits the wealthiest households. The thing is – @JoshFrydenberg & @KellyODwyer know this is a tax loophole that benefits the wealthiest households- they are simply manipulating statistics and counting on everyone not to look too closely.